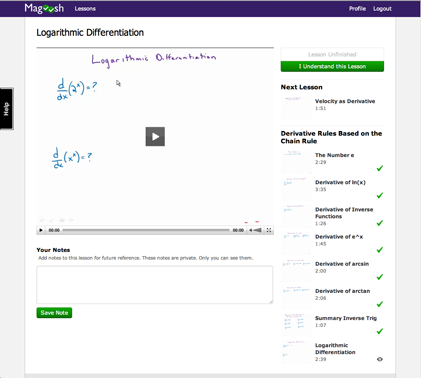 Improve your math skills with video lessons from expert teachers. Study online wherever you go. Our clean and simple interface gets out of the way and lets you learn. Access our videos on the go. Study on your smartphone or tablet with our Android and iOS apps. You don’t need expensive classes and private tutors. Studying online is easier and we pass the savings on to you. 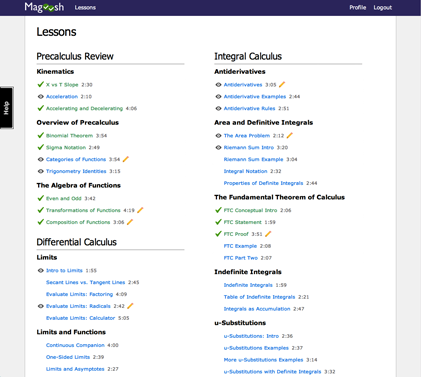 Magoosh's Calculus lessons cover everything from precalc review to advanced integration. With Magoosh you'll be a mathlete in no time. Every lesson is made by one of our expert instructors. Watch the video, take notes and mark when you’ve finished a lesson. We'd love to hear from you. Please send an email to help@magoosh.com.